So........ my son doesn't wear hats. Except, of course, when it's an Angry Bird's Hat. 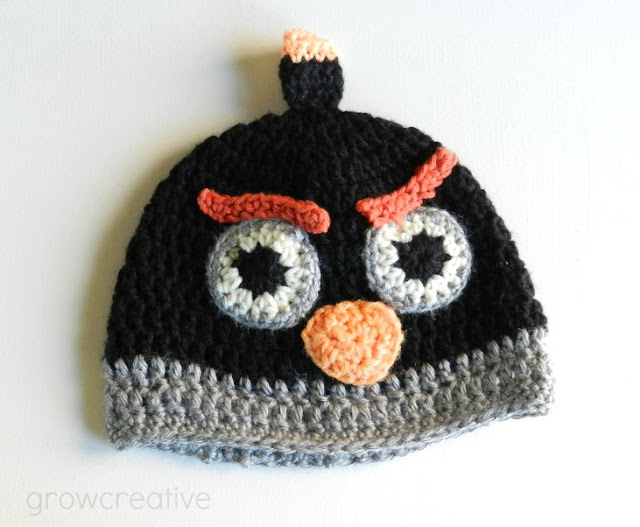 I knew that making a Black Bomb Angry Birds Crochet Hat for him was the only way I would keep his head covered this winter, so I spent an entire evening designing one. Beginning Ch 2 of each round does not count as a dc. End each round in st before/next to beginning ch 2. Join each round with sl st in top of dc, not ch 2. Fasten off. Leave long end tail for sewing the eye onto the hat. Weave in ends. With dark orange yarn: ch 11, sc in 2nd ch from hook, sc in each st across. Fasten Off. Leave long end tail for attaching to cap. Round 1: With light orange yarn: ch 3, 9 hdc in 3rd ch from hook, join. Round 2: Ch 2, *4 hdc in 1st st, sc in next 2 sts. Repeat from *around, join. Row 1: sc in 2nd ch from hook, sc in each st across, turn. Row 2 & 3: ch 1, sc in each st across, turn. Row 4 &5: Ch 1, sc in each st across, turn. Fasten off, fold in half- long ways. Stitch top and open side closed. Cute! My grand children will love this! I love this! So adorable! Pinned it! This hat is so cute! You are a talented crochet designer! Love it! Its on my crochet pin board too! I made this hat today in the child size! It was very quick and easy to hook. Thanks for the easy to read and follow pattern!